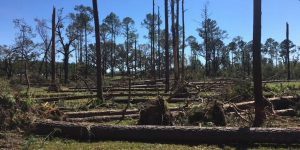 The Weather Channel recently released this 11-minute video which talks to farmers in southwest Georgia about their experiences with the aftermath of Hurricane Michael and what it has meant for their life and future as farming families. How have they been able to cope with the economic losses sustained in the storm and what are their prospects for the future? Many farmers may not be able to recover the losses from timber (which lost 90 percent of its value after the storm due to the glut of downed trees) and pecans (it takes money to remove all the destroyed trees and plant and then to wait for 8 years for the trees to become productive). You can read the story and see the video at https://features.weather.com/collateral/harvest-recover-and-risk-after-hurricane-michael/. Posted in Climate and Ag in the news, Forestry, Forests, Fruit, Tropical weather. Bookmark the permalink. Previous: Georgia Climate Project: How to communicate costs of health impacts due to climate change?